The Spring 2014 issue of NECSUS will feature a special section dedicated to the broad concept of ‘Traces’. On a meta level the ‘trace’ can be related to the idea of the (photographic) image as an index of an independently existing reality. The digital seems to have changed this footprinting-idea of the relation between image and actuality, but has it really? How can we rethink our globalised digital media culture in retracing ‘indexicality’? As the debate about the loss of the indexical in the photographic image has subsided, what does this concept offer us for understanding the current mediated world we live in? Traces also connect to the idea of ‘visible evidence’ that is traditionally found in documentary studies. How does the documentary continue to ‘trace’ reality? As images can be manipulated and changed easier and quicker than ever before, is there a new hunger for traces of reality, as evidenced in the renaissance of documentary as well as in new formats on television and online? Big data sets and online archives change our conception of history. With more data and information accessible than ever before, what does this mean for the construction of history and collective memory? Traces can be related to the idea of ubiquitous cameras, computers, and screens that ‘track and trace’ every step we take, both in the real world and online. How can we re-think surveillance culture? How can we investigate the multiple ways in which our steps and data can be traced in a control society? How does the possibility of constant self-monitoring impact our idea of (a mediated) self? What answers or forms of resistance do cinema, television, and new media art provide us? We look forward to receiving abstracts of no more than 300 words, 3-5 bibliographic references, and a short biography of no more than 150 words by 31 July 2013 at the following address: g.decuir@aup.nl. 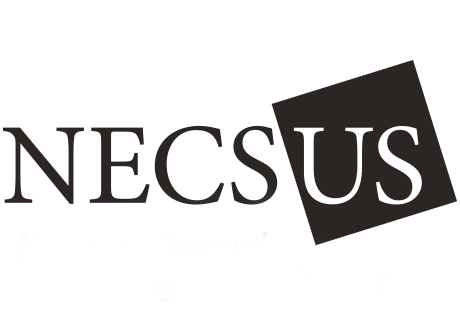 NECSUS is also accepting abstract submissions on a rolling basis throughout the year for other articles related to media studies, in addition to proposals for reviews of all types (conferences, festivals, exhibits, books, websites, etc.). View our submission guidelines here.